This weekend it felt like Melbourne finally got that touch of spring and gave us some much needed sunshine and beautiful blue sky. After months of heavy slow cooked food, red wine and baked treats, my body is screaming for some long overdue exercise and lighter foods. This Asian Herb and Cucumber Salad is fresh, zingy and healthy (provided you don’t go crazy with the crushed peanuts on top). Thoroughly wash the Asian herbs and dry (use a salad spinner, or paper towel). Tear off the leaves and place into a medium bowl. Slice the spring onions very thinly on an angle. Place into the salad bowl. Peel the Lebanese cucumber with a vegetable peeler, then peel long thin strips of the cucumber flesh into the salad bowl. Stop peeling strips once you hit the seeds. Place lime juice, olive oil, salt and pepper into a small bowl. Mix gently with a spoon and then toss through the salad just before serving. Place crushed peanuts on top of the dressed salad and serve immediately. Coconut rice is one of those things that that I keep eating even though I know the saturated fat is going to eventually kill me. I guess this is the reason why so many middle-aged lawyers I know end up with gout. The sweet, nuttiness of coconut rice goes wonderfully with Thai or Indian food. Although it is definitely not an everyday food, coconut rice is a perfect side dish if you are having friends or family over, as you won’t be alone and tempted to eat the whole pot in one sitting. Like all (half) Chinese Singaporeans, I make my rice in a rice cooker. You could also make this dish in a pot on the stove. You would first need to bring the rice to a rapid boil for around 5 minutes and then reduce the heat to low, place the lid tightly over the pot and steam for 25 minutes or so. Place the rice in rice cooker (or pot) and rinse. Place coconut milk, water, desiccated coconut, salt and sugar in rice cooker. Stir to ensure all ingredients evenly combined. Add ginger, curry leaves and lemon grass to rice cooker. Cover and set to ‘cook’. Once the rice cooker finishes the cooking cycle and switches to ‘warm’ mode, allow rice to steam for a further 10 minutes. 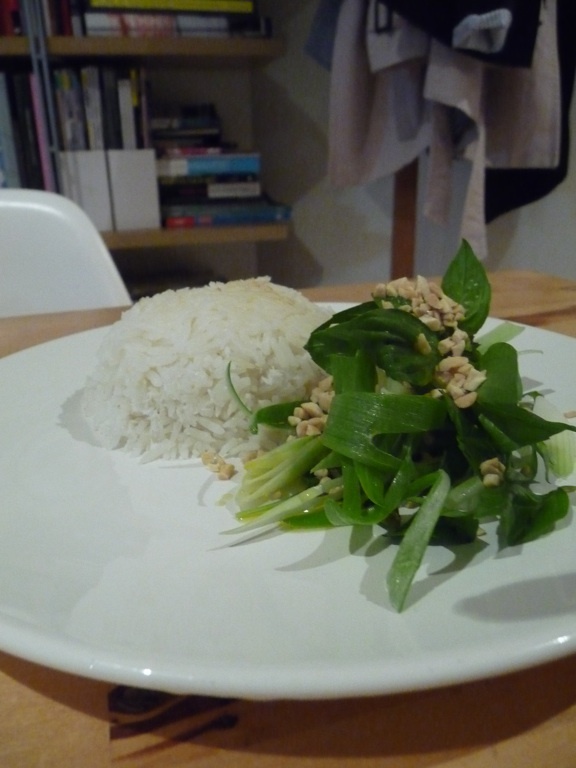 Fluff the rice with a fork or chopsticks and remove lemongrass and ginger prior to serving.